In the city of Cambridge, you may stumble upon one of its most well known architectural buildings in the area: The Cambridge Mill. This historic building, made out of remarkable, locally quarried rock, is one of Southern Ontario’s finest rustic locations to host a wedding. The location is beautifully situated along the waters edge, with breathtaking panoramic views of the river from their relaxing all-season patios. The Mill provides a sophisticated, yet rustic atmosphere for a gorgeous event. With its unique interior design, and delectable fine dining and accommodations, guests and family members will be impressed with this magnificent and picturesque venue. The venue’s grounds contain a charming Pavilion, dedicated exclusively to holding the ceremony. Capable of holding up to about 200 guests, the chapel is glass-encased and lets in light from all angles of the room. This delightful area is fully sheltered and protected, therefore the elements and weather outdoors does not affect the function. As a wedding photographer, I enjoy shooting ceremonies in outdoor locations such as this one because of the natural lighting and unique design of the room. 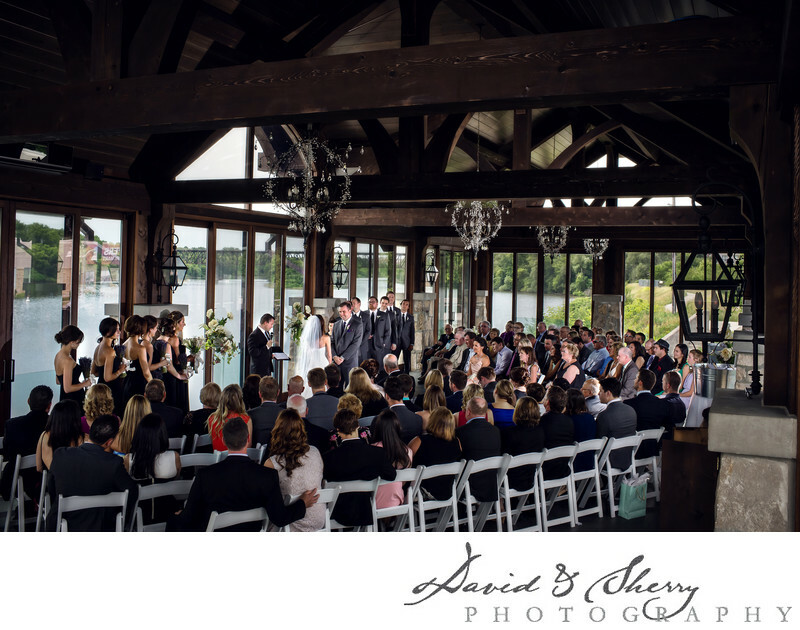 From the wooden beams and high ceilings, to the glass backdrop overlooking the water, the Pavilion provides an excellent place for a bride and groom to exchange vows and become husband and wife. Location: 130 Water Street North, Cambridge, ON N1R 1P1.